1. Eat vegetables, fruits and whole grains. Eat fresh fruits and vegetables as often as possible. Many times, as a dietitian, I say – frozen, fresh or canned are all acceptable, just eat fruits and vegetables. In this case, fresh is best. Sodium is used as a preservative in canned and frozen foods, so this would adversely affect your blood pressure. 2. Include fat free and low fat dairy products, fish, chicken, beans, nuts and vegetable oils. Fat free and low fat dairy products are the best choice for the DASH meal plan. Choose the low fat or non-fat versions of cheese, ice cream, milk and sour cream. Also, red meat is usually avoided due to its high amount of saturated fat. Dried beans and legumes are a great source of protein and offer a bulkiness that will keep you feeling full for a long time. Nuts are suggested, but always choose the no salted nuts or lightly salted. Vegetable oil is a good option, but in moderate amounts. 3. Limit foods high in saturated fat. High amounts of saturated fat is usually found in animal products like red meat and full fat cheeses and milk. Saturated fats can block your arteries, which makes it harder for blood to flow through them, causing your blood pressure to raise. Avoid tropical oils like palm or coconut because they are high in saturated fat. 4. Limit sugar sweetened beverages and sweets. Sugar sweetened beverages are simply empty calories. If it isn’t used for energy, it turns to fat. There is absolutely no nutritional value to sugary beverages such as soda. Sweets should be eaten sparingly. I am not one to say stay completely away from sweets because THAT would cause me major stress!! But eat sweets in moderation. Below is a daily intake guide, which is just a suggestion of daily servings of each of these nutrients. If you are trying to restrict calories for weight loss, you would want to choose the lower end of the range for each food group. When looking at servings per day, please remember that serving sizes are different for each food. For example: A serving of bread is 1 slice; a serving of vegetables is usually ½ cup. You can look at the food label on any product and it will show you what a serving is for that particular food. Always follow your doctor’s advice; this is not a medical recommendation, but an informational guide. 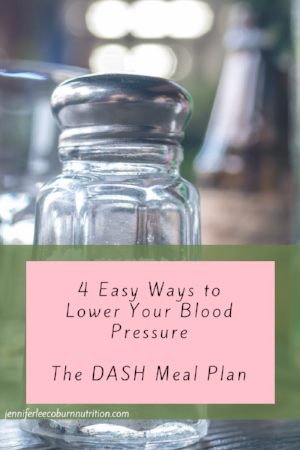 Want an example of a 2-day DASH meal plan? Click the button below and it will be sent to your email!